Overall, I like some of the new changes in IE 8.0 but one feature in particular is driving me crazy: the delete option on the drop down URL list. The little red “X” is located in a column almost immediately beneath the drop down arrow. Mechanically, my natural URL selection motion drops the mouse pointer right over the delete button or close enough to it that every third or fourth time I scroll down to select a URL, I accidently delete the address I’m looking for. 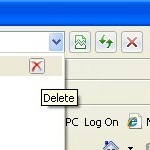 Very poor implementation of a GUI feature especially considering IE8 doesn’t offer any options to change the behavior. I’m not the only person who thinks this “feature” is annoying.